Patra's Other Place: Ken's last day at work. 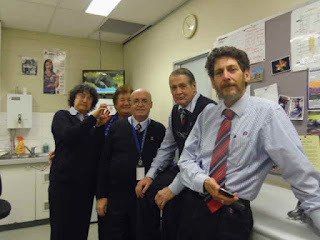 Some of Ken's workmates at Melb. Path. wanted to take him out for drinks after work, so I drove him in to work on Friday morning because he had two huge mudcakes for the staff at both Melbourne and Dandenong offices where he goes every day, and he wouldn't have been able to carry them on his bike! I drove in to town about 5 pm to join them for drinks, and bring his gifts home in the car. He had just arrived back in the office after his last run, and was overwhelmed with the gifts and cards he'd been given. The girls put on a few snacks for the couriers who were still around, and then a few of us went to a nearby pub and had a few drinks (I only had one G & T because I was driving), then Ken and I decided to stay and have a counter meal for dinner instead of going home and cooking, as it was getting late by then. Just as well we did all that because a storm developed around 6 pm and it poured rain all night, so Ken would have got saturated riding home on his bike. 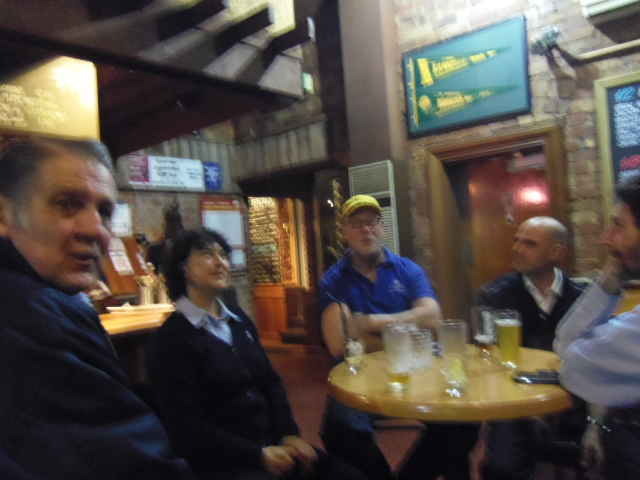 Ken second from right with some of his workmates in the couriers' tea room. A few of us at the pub...my camera battery was going flat again, and I assume that is the reason for this blurry photo. Some of the others took photos on their phones, so I'm hoping they will email them to us. 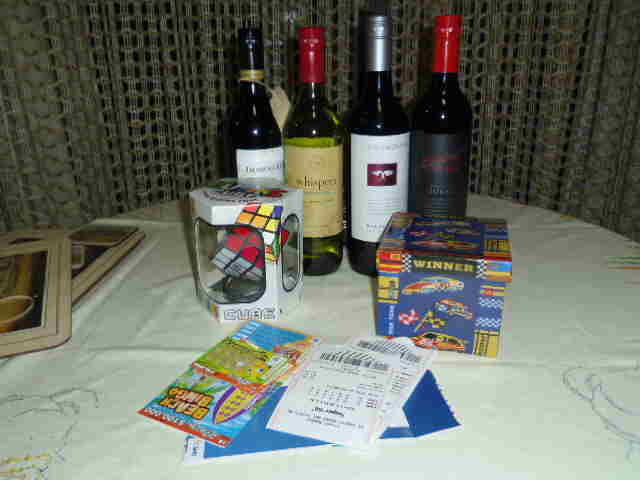 Four bottles of wine, a Rubiks cube (the giver must have thought Ken might be bored once he retired), a box of goodies and some Tattslotto tickets. 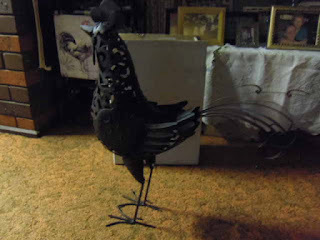 This garden chook was a gift from one of the ladies at Dandenong who has chooks of her own and knows we have them too!